Read more about IDF's youngest Social Ambassador - Karan Dravid. The Times of India, Bangalore edition of 25th November 2007 has given a wide coverage. BANGALORE: "Uncle, if you've an old working computer, give it to me. I'll pass it on to the poor tribal children so that they can learn English." That's eight-year-old Karan Dravid speaking on his own, no cues, no prompts. Unlike the children of his age who kid around with toys, Karan dons a thinking cap: "All children should know English. They shouldn't be begging or working in hotels, but should go to school." He enjoys mingling with tribal kids in BR Hills, teaching them English every weekend and during vacations. Mumbai-based NGO, Indian Development Foundation, has roped in Karan as young ambassador to promote rural empowerment initiatives. 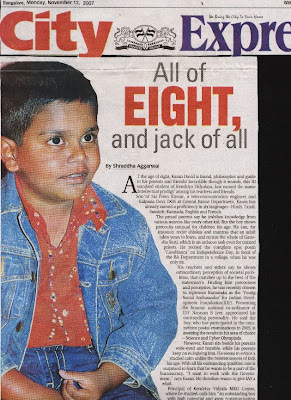 He's a whizkid — knows six languages, including French, memorises shlokas and has an enviable language-learning skill. At the same time, the child in him is very much active: he plays and dances with peers at his school, Kendriya Vidyalaya, MEG Centre, and watches latest movies. "We haven't taught him much, but only answered his queries," says his father Sai Prem Kumar, an engineer. "We found that Karan, at three, was inquisitive and had good memory. An answer to his query would be etched in his mind and he'd interpret in his own way." "Once he wanted to know why some children didn't know English. I told him they were poor and hence couldn't go to school. Since then, he has taken it upon himself to do something for the poor," Kumar recalls. 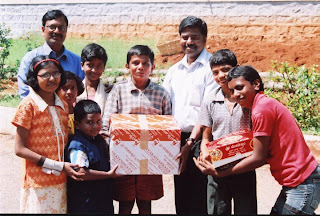 Without parents' knowledge, Kiran met his principal, talked his friends into mobilising a load of shoes and clothes for the children at BR Hills Empowerment School. "He had ensured his friends don't give too old or torn clothes," said Karan's mother Kalpana, who works in the excise department. Does Kiran want to become a cricketer, a la his namesake? The boy shoots it down. "Want to be famous?" A big "no", again. "What do you want to become then?" 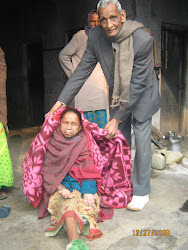 Pat came the reply: "An IAS officer so that I can help the poor and make their children go to school." 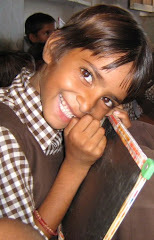 Karan is also interacting with reputed schools to get the students work for the poor. His priority: "Want to request all uncles in big posts to give me old computers." Flawlessly reciting the Song of Youth , Karan says: "I know APJ Abdul Kalam's full name. I'd like to meet him. Do you have his email ID, uncle?" As per the World Health Organization estimates, out of total 37 million blind persons (Visual Acuity <3/60) in the world, 6.7 million are in India, which is one-fifth of the total global blind population. As per the Eye Bank Association of India, Hyderabad, there are 500 Eye Banks/ Eye Donation Centres in the country including 148 in Maharashtra. Around 30,000 donated eyes are collected annually in the country. There are about 6000 Optometrists in India and about 1200 pass out every year. More Optometrists are needed to fulfill patients’ requirements for eye care in the country as the Ophthalmologists – para medical personnel ratio should be 1:4. As per the survey conducted during 2006-07, the prevalence of Blindness in the country has come down to 1% as compared to 1.1% during the year 2001-02. The National Programme for Control of Blindness (NPCB) is committed to reduce the burden of avoidable blindness to 0.3% by the year 2020. 1. Setting up of State Blindness Control Societies and District Blindness Control Societies in States/UTs. 2. Providing Eye care facilities to the needy people at Primary, Secondary and Tertiary levels through Primary Health Centres, District Hospitals, Medical Colleges and Regional Institutes of Ophthalmology. 3. Strengthening of Eye Banks in Government/Voluntary Sector. 4. Financial support to NGOs for strengthening their existing infrastructure for Eye care and providing recurring grant for Cataract surgery, School Eye Screening and Eye Donation. 5. Organizing Eye Donation Fortnight from 25th August to 8th September every year to promote eye donation. 6. Screening of School Children for detection of refractive errors and providing free spectacles to poor children. 7. Strengthening of Regional Institutes of Ophthalmology/eye departments of Medical Colleges by providing assistance for development of paediatric eye units/low vision units/retina units and training infrastructure. 8. Imparting training to Ophthalmic Surgeons from Government Hospitals/Medical Colleges for quality eye care. 9. Intensification of IEC activities to create awareness about eye care activities. This information was given by the Minister for Health & Family Welfare, Dr. Anbumani Ramadoss in a reply to a question in the Rajya Sabha. Glaucoma has been nicknamed "the silent sight thief". Worldwide, it is the second leading cause of blindness. Glaucoma affects one in two hundred people aged fifty and younger and one in ten over the age of eighty. Untreated glaucoma leads to permanent damage of the optic nerve and resultant visual field loss, which can progress to blindness. ......................One person may develop nerve damage at a relatively low pressure, while another person may have high eye pressure for years and yet never develop damage. Symptoms or signs of glaucoma are often absent in the earliest stages of the disease. Tragically, impaired vision is sometimes the first sign of glaucoma.There is no cure for glaucoma, but there are treatments for glaucoma, and they fall into two categories: medication and surgery. Both of these treatments for glaucoma manage the disease by lowering the intraocular pressure. For more details click on the link given below. Meet IDF's youngest Social Ambassador - Karan Dravid from Bangalore. Klick on the report to zoom Karan. Cape Town (PTI): A global campaign with the slogan 'I am Stopping TB' aimed at challenging people all over the world to participate in the anti-tuberculosis programmes has been announced by the World Health Organisation's Stop TB Partnership. 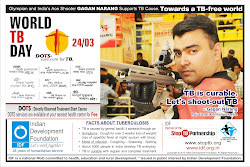 The campaign will be launched early in 2008 in the run-up to World TB Day. Plans for the campaign were announced by Stop TB Ambassador Anna Cataldi at the opening ceremony of the World Conference of the International Union Against Tuberculosis and Lung Disease here on Friday evening. 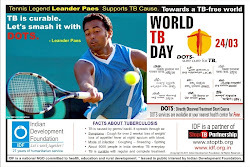 World TB Day is held each year on March 24. "The slogan 'I am Stopping TB' says that everyone can take an active role in helping all people in need gain access to accurate TB diagnosis and effective treatment," Cataldi said. "The challenge we are putting to people across the world is, 'What are you doing to stop TB?' Please join us in the fight," said Dr Marcos Espinal, Executive Secretary of the Stop TB Partnership. There are nearly nine million new cases of TB worldwide and the disease kills more than 1.5 million people every year. The Stop TB Partnership is a network of more than 500 international organisations hosted by the WHO and is based in Geneva, Switzerland. IDF team celebrated Diwali with the inmates of Sumanahalli Leprosy Centre, a society for Leprosy, Tuberculosis and HIV/AIDS at Magadi Road, Viswaneedam in Bangalore on Thursday the 8th Nov. 2007. IDF team included the youngest IDF Ambassador Master Karan Dravid, Mr. Sai Prem, Miss Francila and Dr. S. Franklin who were received by Rev. Fr. Dr. George Kannanthanum. Dr. S. Franklin, Area Manager, IDF greeted the inmates of the Centre while handing over dress materials to Rev. Fr. George for distribution to the patients of the Centre. 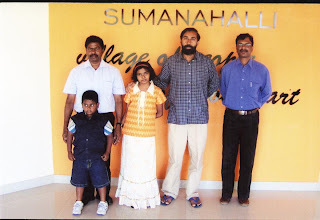 Dr. Franklin appreciated the work of Sumanahalli in the areas of leprosy, TB and HIV/AIDS. The team presented Diwali sweets to the inmates of the Centre. IDF’s young ambassador Master Karan Dravid talked to the patients and asked them to narrate their stories. He also recited Dr. Abdul Kalam’s poem 'Song of the Youth' much to the pleasure of the patients and the staff as well. A bright glimpse of happiness could be seen on the faces of the inmates as Diwali festival was celebrated with them. The patients thanked IDF team for visiting them on the festive occasion and blessed the young Karan in his mission towards serving the needy. 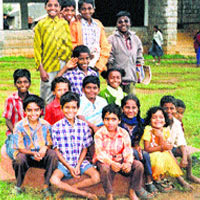 Sumanahalli is taking care of 120 leprosy, tuberculosis and HIV/AIDS victims. It has a textile unit, leather unit and a candle making unit towards the rehabilitation of the patients. Some of the able bodied patients are involved in gardening and other related tasks. Rev. Fr. George and Rev. Sr. Suma from the Centre expressed their thanks for arranging such a meaningful event during the festive occasion and sharing happiness with their Centre inmates. Indian Development Foundation in collaboration with Rotary Club of Mumbai North End celebrated Diwali Festival with the inmates of Vimala Centre at North Mumbai on Wednesday the 7 th Nov. 2007. Leprosy patients deserve guidance and support from the public on a continued basis to enable them to overcome the stress caused by the disease and to get rehabilitated on new assignment after cure, observed Dr. A. R. K. Pillai, President of IDF. The child patients deserve our care and attention in a far greater measure, he added. Rotarian Satish Trivedi, President of Rotary Club of Mumbai North End said the child patients feel so elated when citizens meet them with sweets and sparklers. They feel that they have someone to look to and this feeling promotes confidence. Rotarian Trivedi quoted the Sisters of the Centre as Angels who takes care of the inmates in a beautiful manner. Interaction with patients gives excitement and boundless happiness, he expressed. Rotarian Satish Trivedi presented a donation cheque from the Rotary Club to Indian Development Foundation for its health, education and development objectives. Rev. Sr. Bertilla Capra presented IDF memento of Appreciation to Rotarian Trivedi for the continued support to leprosy programmes. Prof. P. Thangadurai, NSS Co-ordinator, Vivek College of Commerce – Rotarian Mr. Mohanbhai Bhatt – Mrs. Jaishree Sawla, IDF Supporter - Mr. S. B. Parate, Voluntary Officer, IDF – Mr. S. Karthick, Social Entrepreneur of IDF spoke about the spirit of Diwali Meet with leprosy patients. Meeting fellow humans in distress during festival time and sharing sweets with them brighten the lives of the giver as well as the patient, they said. Citizens drawn from different walks of life wished the patients a Happy Diwali and speedy recovery. Flowers, fruits, sweets and eats were distributed to the patients and in addition the children received packets of sparklers. Citizens freely mixed with the patients, exchanged pleasantries and assured them of social support. A bright happiness was seen on the faces of the patients when citizens greeted them. Vimala Centre wore a festive look with decorations to mark the Diwali Festival. Ravi and Sujatha from Vimala Centre expressed their heartfelt thanks to the Vimala Sisters for their care and concern towards the inmates. IDF Diwali celebrations in deed added more colour to their lives, they said with a smile. Members of Rotary Club of Mumbai North End participated at the function and appreciated the progress achieved in the leprosy field and wished the patients well. Visitors from Italy led by Mr. Franco felt happy as they participated in the citizens' Diwali Meet. Earlier Dr. Narayan B. Iyer, Co-ordinator, IDF welcomed the gathering while Rev. Sr. Bertilla Capra, Director of Vimala Centre proposed a vote of thanks. For photographs please click the link in The Mangalorean.com website from Chicago. Greetings and good wishes for A Happy, Prosperous and Healthy DIWALI ! You are cordially invited to participate in the Diwali Celebrations programme with leprosy patients at Vimala Dermatological Centre , Yari Road, Versova, Andheri (West), Mumbai 400061 on Wednesday the 7th November 2007 at 4.30 p.m.
Rotary Club of Mumbai North End and Indian Development Foundation are jointly organising this event . Citizens' Diwali-Meet provides an opportunity for citizen's to meet and greet leprosy patients with flower, fruits, sweets and gifts, and wish them a Happy Diwali and speedy recovery. This interaction between the citizens and patients had drawn public appreciation during last twenty five years now. Rotarian Mr. Satish Trivedi, President, Rotary Club of Mumbai North End and Dr. A. R. K. Pillai, President of Indian Development Foundation will speak about the spirit of Diwali Meet at the function. Rotarians, Principals and Teachers from various Schools and citizens from various groups are expected to take part in this event. We request you to participate and share the joy of satisfaction.